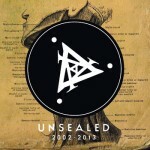 Älymystö is proud to present the first album since Atomgrad, Unsealed (2002 – 2013). What you get is a collection of unreleased tracks from Älymystö’s 11 year old journey, reimaginings from songs that are already familiar to you, and something totally new you haven’t yet heard even on gigs. Get the album from Band Camp, and share the news! Then come see us at Infektio this Saturday or in Latvia next week.